Already available for Apple’s iOS and OS X platforms, the Android version supports smartphone and tablets equipped with Google’s operating system, starting from version 4.0 to the latest 6.0. 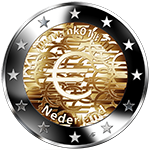 Considered among the most comprehensive and visually appealing apps about Euro coins, the Android version retains all the features that set it apart: interactive album, detailed images and parameters of both standard coins and 2 Euro commemoratives, information texts and translation in seven languages. The first 13 2-Euro commemorative coins of the 2016, already issued or announced, are listed, including those of Belgium and Portugal dedicated to the incoming Summer Olympics in Rio de Janeiro. In addition to the 184 standard coins issued by the 23 Euro-area countries, the total of of 2-Euro commemorative coins has reached the figure of 244. Write to davide.orlando@albegor.com to request a promo code to download the Android app for free! Zojuist geinstalleerd met de promo code. Het werkt prima.